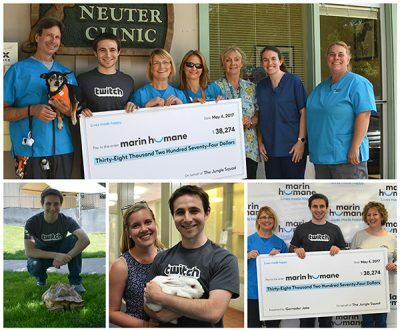 Combining his love of gaming with his love of animals, Marin County resident Jake Straus raised more than $38,000 over one weekend for Marin Humane in the first-of-its-kind fundraiser. Jake is a full-time video game streamer who grew up in Marin and has 140,000 followers on Twitch (a popular streaming video playing site). Over the course of one weekend, Jake dedicated 36 hours of his time, rather than accept tips from his followers and fans as he usually does, he encouraged them to donate to Marin Humane. 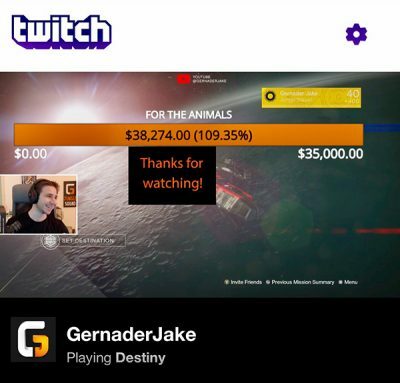 Known online as GernaderJake, he not only set out to raise money for animals but to prove that the gaming community can be altruistic. “Humbling and inspiring are the words that come to mind after this weekend’s events. This gaming community demonstrated so much love and care for the well-being of animals, and I could not be more proud,” Jake said. Followers and fans (gamers and non-gamers alike) got to watch the action all weekend on Twitch and donations ranging in amounts from $1 to $4,000 poured in from across the globe.